Validate your candidate’s education claims through direct correspondence with the institution or association. We have developed excellent business relationships with major domestic and international educational institutions. 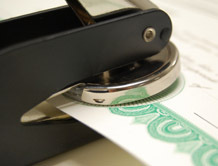 Our experienced processes provide the best route to obtain quick and accurate verifications. Official verifications are the best method of determining a candidate’s true credentials. Certification printouts and membership correspondence are too often fabricated or out of date.